WLP hosts a series of FREE family-friendly guided hikes on the Whitefish Trail and children’s programs at the Whitefish Trail Learning Pavilion. Guided hike topics include a spring wildflowers hike, bird watching, mushroom identification and forest discovery. Youth specific hikes will include nature photography, field sketching, nature art, insects, and forest exploration. Due to increased popularity we are no longer able to accommodate drop-offs at our free kids’ education programs. All kids must be accompanied by an adult. Wrap up summer by exploring on the Whitefish Trail! These four day youth camps for children ages 6-10 include hiking, lessons in natural history, interactive games and art activities at the WT Learning Pavilion. Limited space is available and pre-registration is required. Sign up for one week or both! Girls on the Trail is a collaboration between Whitefish Legacy Partners and community partners to bring teenage girls ages 12-15 out on the Whitefish Trail through a series of mountain biking, hiking, and volunteer events. Girls on the Trail provide teenage girls in the Flathead Valley an opportunity to find their own love of mountain biking, their own appreciation of trails and open lands, and their own strength through hard work and mentorship. Participants are asked to attend all four events. 2019 Girls on the Trail dates coming soon! Join us for the Nature in Focus Program, introducing youth to outdoor photography. Open to students ages 12‐18, the Nature in Focus workshops teach photographic composition and technique through hands‐on demonstrations and constructive feedback. Each workshop takes place on the Whitefish Trail and is led by a local professional photographer, and WLP Staff. Space is limited and pre-registration is required. Come for one workshop or come for all. Learn more about the Whitefish Trail Photo Contest. 2019 Nature in Focus dates coming soon! WLP’s Goals are to provide relevant school curriculum programs, encourage outdoor education and increase awareness of the Whitefish Trail. Annual field trips are coordinated with Whitefish School District. Freshman visit the trail in early spring and learn about trail maintenance, fitness and forestry. 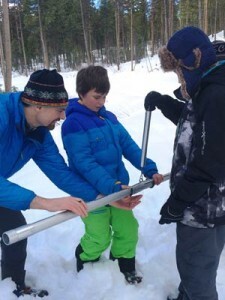 Sixth graders explore the trail in fall and winter to study snow science and avalanche safety, and third graders come in the early spring to learn about the water cycle. The series culminates with two field trips on the Whitefish Trail that include hiking, games, hands on activities and art projects exploring native plants, bears, orienteering, insects, and predator and prey.